Other: Address while at school: 6 Thirlwell Terrace. At time of death address given as 219 Greystone Road, Carlisle. 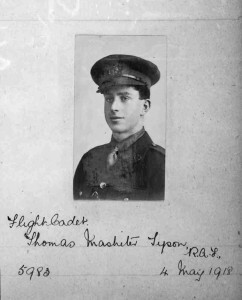 During the Great War, Thomas was a cadet in the R.A.F. and had taken his certificate on a Graham-White Biplane at Hendon on May 4 1918. According to the memorial register, he was accidentally killed whilst flying in Derbyshire, on June 12, 1918. In fact he was killed at Narborough Airfield in Norfolk. At 6.30am Thomas had taken up an aircraft assigned to the Americans based there, it was a rebuilt Armstrong Whitworth FK3 (B8827). According to the subsequent court of enquiry Thomas was neither experienced or qualified enough to fly this aeroplane solo. He had no orders to do so. He stalled the machine shortly after take-off and as he turned the aeroplane it nosedived into the ground from a height of 50 feet and caught fire. Pinned by his feet, Lieut EB Humphries and A/Cpl OC Meckel, rushed into the flames in a brave attempt to save him. The fire engine arrived and Thomas was pulled from the burning plane. His commanding officer later commended the two men for their “great presence of mind and courage”. A telegram was immediately sent to his parents to “come at once” as their son had been seriously injured. This was followed up by a second telegram an hour later to report that Thomas had died without regaining consciousness. He left a mess bill of £2 5s 9d. The Inventory of his belongings (over 100 items) contains everything from the most mundane (one pair slippers; eight pairs. socks etc) to some items that give us some clues about his interests (13 pieces of music; six novels; one vest pocket Auto camera; three pipes and a tin of tobacco) He was buried at Narborough All Saints Churchyard. A sad postscript was a document from the O/C of 121 Squadron to the Air Ministry in London concerning a complaint from Thomas’ father about the cost of his travel from Carlisle (£6 5s) which he had paid as the then O/C had omitted to explain he could apply to the nearest Police Station in case of difficulty for fear of offending him.